.....and paddock and harpier. These are the other familiars mentioned in Macbeth, however, they are NOT cats. Chelle was the first to post the name of the cat familiar from Macbeth- it was/is Graymalkin! Thank you sooo much Chelle for participating. Your yarn is going out very soon. 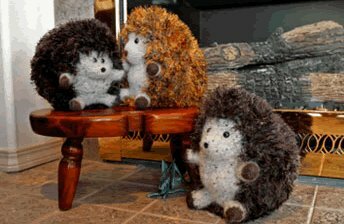 Actually, the other two familiars are quite interesting too - Paddock is a Hedgehog. (Please ignore anyone who says he's a toad - he isn't.) He has to be a hedgehog, because Fiber Trends has just brought out a brand new pattern for knitted felted hedgehogs, not toads. Harpier is a little more difficult; he's an owl. 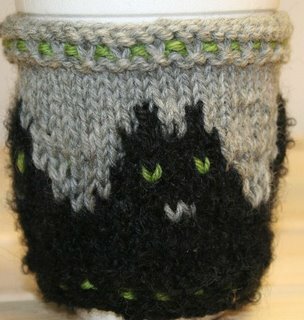 Sorry no knitted owls - any takers? Anyone interested in knitting and/or felting an owl will receive a special prize......not sure what it is yet...but it will have to be a good one as there are lots of collectors of owls out there. And there are lots of Owl references in literature - I Heard the Owl Call My Name - comes immediately to mind. Please post any other references or quotations of interest related to owls, hedgehogs and cats. These are said to give us " divine" inspiration! 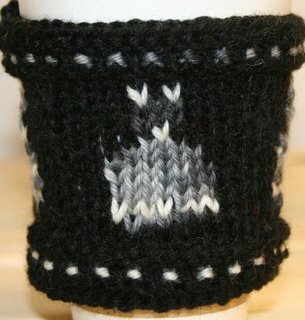 I also have the first coffee coat or java jumper or whatever... I call it "coffee cats". I was no doubt influenced by our discussion of cats. My attempt on the left is actually the third or fourth go at something I ended up not really liking at all. My first struggles were with gauge - too small - how do you cover a one inch gap - not very easily. The second was too big - I could have overlapped it and added buttons - next time maybe. I was also trying to get a motled grey cat by using a varigated yarn - this looks more like a cross between a cat and a rabbit. Well Easter is coming! The guy on the left I'm a little happier with although he looks a little - ok, a lot- like the cat on Vermont Fibers sweater pattern shown in a previous post. I am also not that happy with the way the green is lost in the slip stitching at the top. I think it should be black. Then should I change the bottom accent colour to grey or leave the top and bottom "trim" off entirely? I like the cats themselves. There are 4 and they could make for nice company, if you were having coffee alone or needed someone to help you think! You could even give them names! Well come on, I need some help. I am waiting for this inspiration that these wonderful creatures are supposed to impart. When I am happy with the final cover, I will post the pattern.